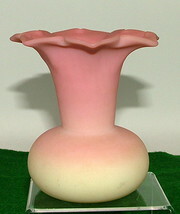 A delicate little pink and yellow vase dating from the 1900s. 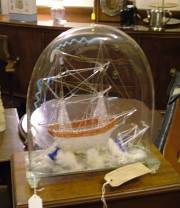 Beautiful and rare Nailsea glass boat. 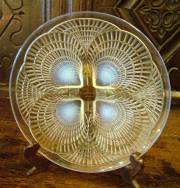 Handblown, possibly an apprentice piece. 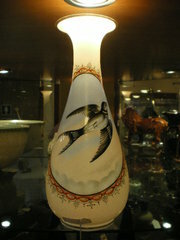 Two victorian lustre vase. 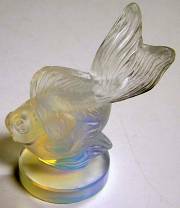 They both have the wonderful appearance of mother of pearl. 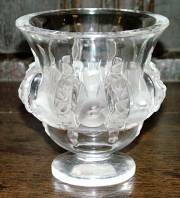 This would have originally been a set of three with the larger vase displayed at the center with the two trumpet vases either side. The trumpet vase stands in a gilt stand with leaf motiff. Large vase approx 8 3/4 ins high. 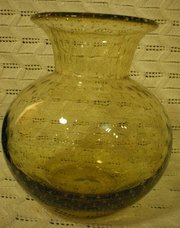 Small vase approx 7 3/4 ins high. 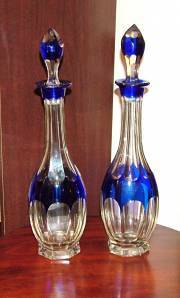 Pair of Clear & Blue Glass Decanters, late 19th Century.